Scrap metal recycling company adheres to four unique core values to deliver top performance. Scrap metal recycling is our business at Ferrous Processing & Trading (FPT). We take it seriously, we do it well, and we seek to make our customer’s experience the best possible! 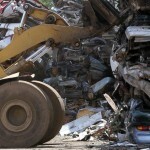 In this modern era, there are many different companies that offer scrap metal recycling services. We understand that our customers have options. That is why we would like to share what makes us different. We are proud of our heritage and our culture of excellence and strive to always deliver a higher standard of service for our customers whether they are selling or purchasing scrap metal materials. One of the main things that sets us apart from other scrap metal recycling centers is our core set of values. They include integrity, responsiveness, expertise, and creativity. Integrity: At Ferrous Processing & Trading, our values are important to us and integrity is our number one! From our largest manufacturing customers to our smallest private supplier, we aim to conduct our services with integrity. This applies to each of our employees from our leadership executives down to the yard laborers, we all understand that integrity is the cornerstone of our business and our success. We are all committed to doing the right thing and are proud of the long-standing relationships this has helped foster in the past. Responsiveness: There are many scrap metal recycling companies across the United States ranging from small mom and pop shops to large corporate entities. We are unique because we have grown to be one of the country’s largest scrap metal processors and sellers, but have maintained our ability to respond quickly and effectively to our customers’ individual needs. Our employees react quickly and decisively to resolve issues or leverage opportunities. When customers need, we can quickly provide the staff, resources, and capital necessary to respond to new developments. Expertise: Another top value at FPT is expertise. FPT is built on a team of management, commercial, and operations personnel with the skills and experience necessary to get each job done right. Everyone at FPT is dedicated to continuing their training and building experience to stay up to date with the latest industry innovations. This way we can provide superior skills and insight to optimize our clients’ experience. Creativity: The final core value at FPT is creativity. We serve a diverse array of customers across multiple industries. Our leadership team is visionary, seeking new ways to implement technology and processes that will benefit our clients. We are proactive in managing market trends, and share a creative perspective towards dealing with the ever-changing scrap metal market.